A leading Northern England equipment hire business has embarked on an ambitious new growth strategy that will increase turnover and create jobs with support from Yorkshire Bank. MTS Nationwide Ltd is extending its hire fleet and opening its first Scottish base after receiving a £500,000 funding package from Yorkshire Bank. The deal was arranged by Pete Sumners, business development manager at the Bank’s Business and Private Banking Centre in Leeds. Founded 30 years ago, MTS Nationwide, which trades as MTS Group, operates depots in Yorkshire, Lancashire and County Durham and employs 42 staff. 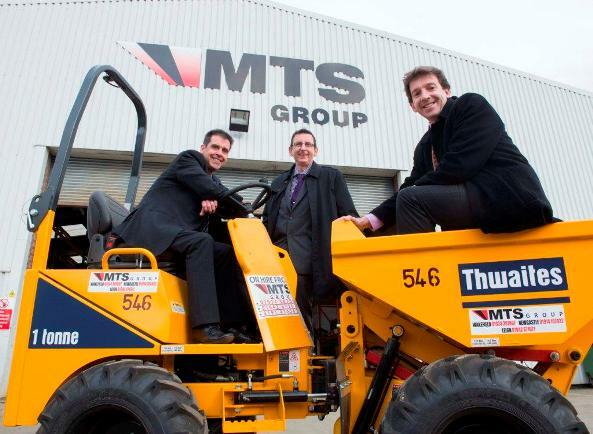 The £6 million turnover business, a new customer to Yorkshire Bank, incorporates three divisions: MTS Welding Hire and Sales, MTS Golf and Utility Vehicles and MTS Plant Hire and Sales, which is the North of England’s leading Bobcat dealership and largest hirer of skidsteer and tracked loaders. It also offers parts and maintenance services, along with specialist training in machinery operation. A substantial proportion of the funding provided by Yorkshire Bank will be used to boost MTS Plant Hire and Sales’ hire fleet. The firm has ordered three new Thwaites dump trucks after seeing demand outstrip supply, with the company forced to turn down customers in some instances, or cross-hire. A review is also being carried out to determine if any equipment requires to be replaced. All rental equipment is changed after three to five years of use to ensure reliability and provide customers with access to the latest technology. The business, which will supply more than 300 golf buggies to this year’s Ryder Cup at Gleneagles, is also expanding to Scotland with a new depot in Cumbernauld. MTS Golf & Utilities is opening the facility in late spring following an expansion of its Northern England partnership with Club Car, the world’s largest manufacturer of small wheel, zero emissions electric vehicles and official supplier to the 2014 Ryder Cup. As part of its Scotland remit with Club Car, MTS Golf & Utilities will deliver more than 300 Club Car golf vehicles to the tournament at Gleneagles – including the two Captains’ cars – and provide same-day support throughout the event. Longer term, the business will focus on the sale and rental of Club Car golf vehicles and parts throughout Scotland, with the aim of significantly increasing short term fleet hire. The expansion is expected to support four new jobs initially, with scope for the creation of further employment as business grows. The group is also considering moving other hire equipment to Scotland to build on its golf base. “With the forthcoming Ryder Cup at Gleneagles, and Club Car’s long association with the event, it is particularly timely to be expanding our business in Scotland. “We are also keen to grow our services across the group. “Peter and the team at MTS have shown great commitment and determination to build this successful business, and their expansion plans, including the creation of new jobs, highlight the crucial role businesses are playing in supporting the economic recovery.